How are students using your lists? Reading Lists provides functionality for students to engage with their lecturers and interact with their lists. 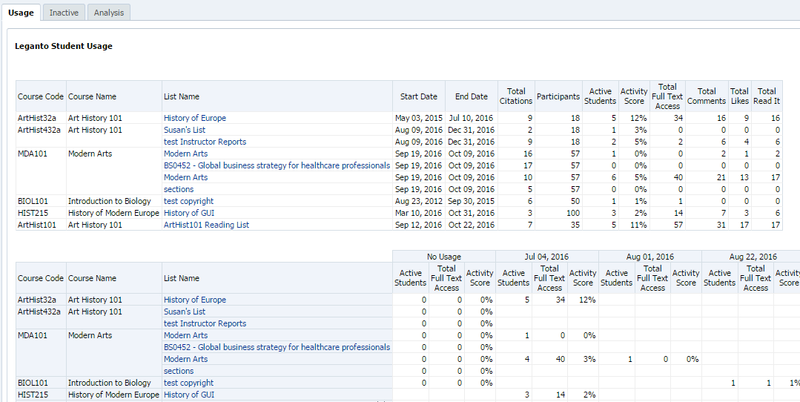 Lecturers can also create reports on student usage and activity on their lists. You can also run more advanced analysis on your lists by clicking Reports on the left hand menu. This area of Reading Lists is currently in development - we appreciate any feedback on the types of reports and metrics you might find useful. Number of Full Text Views - how many times students have opened links to electronic resources on your list. Note that multiple clicks by the same student will be counted. Number of Likes - how many citations have been ‘liked’ by students. Under the Usage tab you can view additional metrics for your lists, including start/end dates, total number of citations and students. The Inactive tab displays usage for lists which are not currently in use. Users can leave comments on items in your lists, using the Discuss this function on the right hand side of the item details screen. You will receive notification of new comments in the Notifications menu on the left hand pane. You can delete these comments by clicking the trash icon. 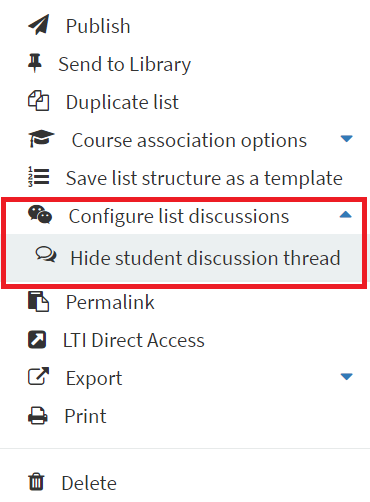 You can hide all student discussion threads on your list by clicking on the Reading List options menu (⋯) in My Lists or from within a list and selecting Configure list discussions and Hide student discussion thread. Please note that the Library does not monitor comments on reading lists. You can view the number of comments received on each item or list through reports (see right). Users can suggest items from their My Collection page to be added to lists. To suggest an item, click on the item options menu (⋯) and Suggest this item. Select the list for which you want to make the suggestion. A notification will be sent to the list managers and the suggestion will appear in the right side panel of the list. The list manager can the drag and drop the suggested item into their list, or delete it by clicking the trash icon. The tick icon next to each item title allows users to keep track of what they have read on your list. You can view the number of students who have marked each item as read on the list page, or through reports​ (see right). Users can like items in the right-hand pane on the citation details page. You can view the number of students who have liked each item on the list page, or through reports​ (see right).